A day-trip to collect specimens for a couple research projects earlier this week yielded an opportunity to photograph these small western alpine laurels. 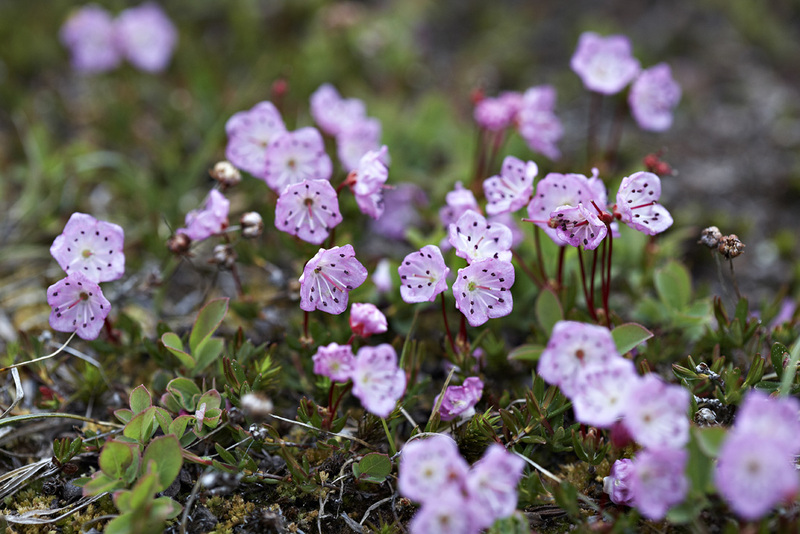 Growing at an elevation of 1920m (6300 ft), these diminutive plants (10cm / 4in) are referable to the broadly distributed Kalmia microphylla var. microphylla of western and northern North America. 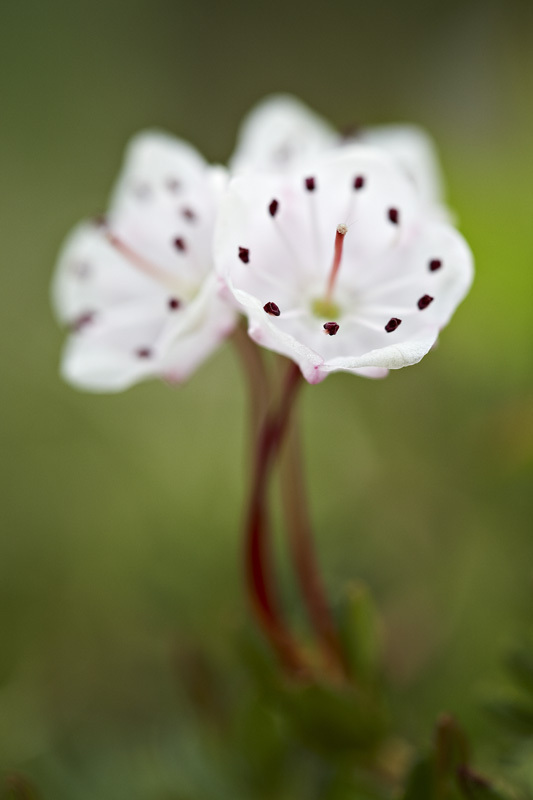 A second variety is recognized by the Flora of North America, Kalmia microphylla var. occidentalis, which tends to be both taller (sometimes to 80cm) and distributed only from Alaska to Oregon at lower elevations. Anatomically, leaf blade shape and dimensions are also used to distinguish the two varieties, with variety microphylla having shorter, stouter leaves. According to Flora of North America, flower colour is “rose-purple, rarely white”, so I was fortunate to find one of the white-flowered plants. Only one small section, perhaps 0.5m2, of the entire local population of these plants was white, so it is possible that the white-flowered individuals were growing clonally. 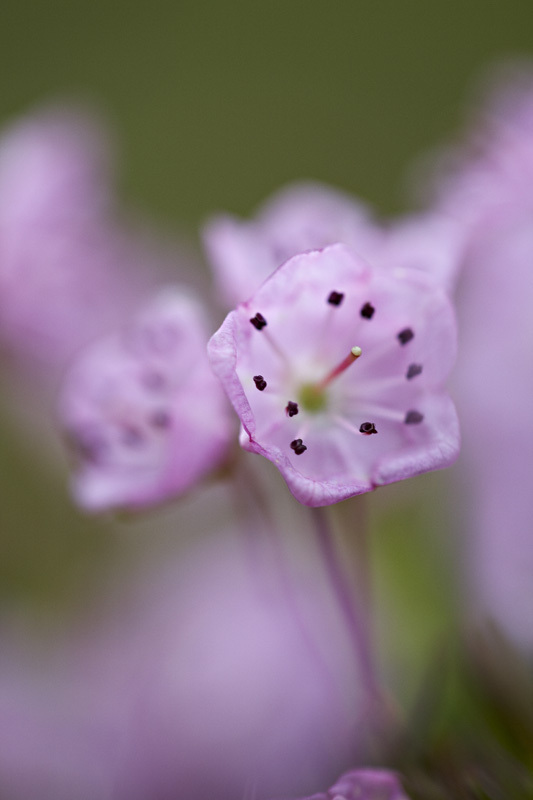 The US Forest Service’s Celebrating Wildflowers site has an excellent account of Kalmia microphylla, and more photographs are available via CalPhotos: Kalmia microphylla. hello,great pictures.i live in penna,i also have a house in Kaslo,b.c.love to go up to see the meadow spring flowers in Sandon. I am new to this forum and absolutely love it.I’m in South Florida and you have given me the opportunity to see beauty that is really a delight. I know it’s the flower shape and the placement of the dark stamen tips against the pink color, but they remind me of Kalmia latifolia, Mountain Laurel. They are so pretty. cloning of leaves of Azaleas, Rhodo’s it was all experimental but they were quite successful a nursery of some kind this was at least 25yrs. photos brings back good memories.